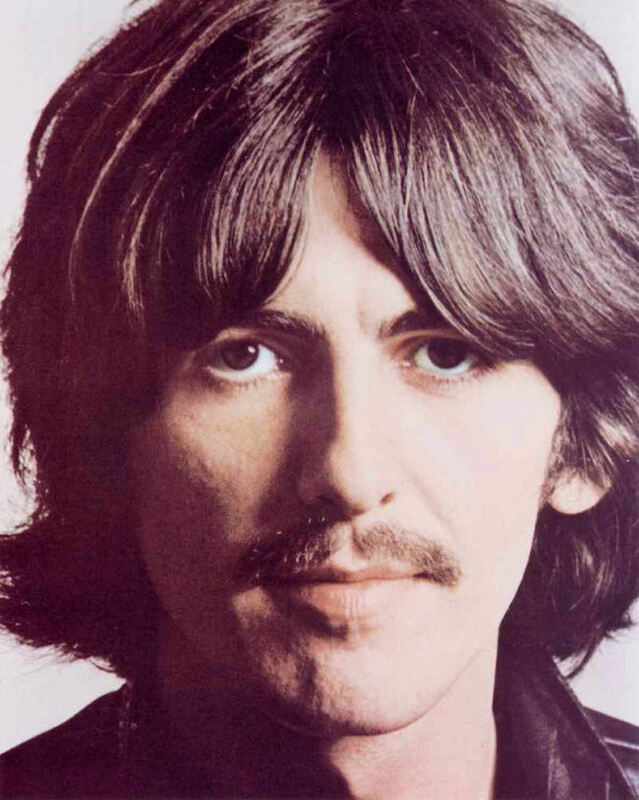 On November 29, 2001, media outlets all over the world reported that former Beatle George Harrison had passed away, having lost his battle with cancer. But such statements were grossly insufficient to capture the breadth of Harrison’s life. 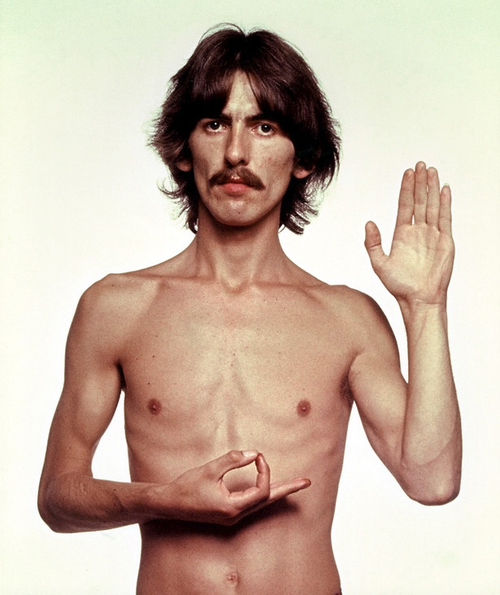 Often referred to as “the quiet Beatle”, Harrison became over time an admirer of Indian mysticism, and introduced it to the other Beatles, as well as their Western audience. Following the band’s break-up, he was a successful solo artist, later a founding member of the Traveling Wilburys. 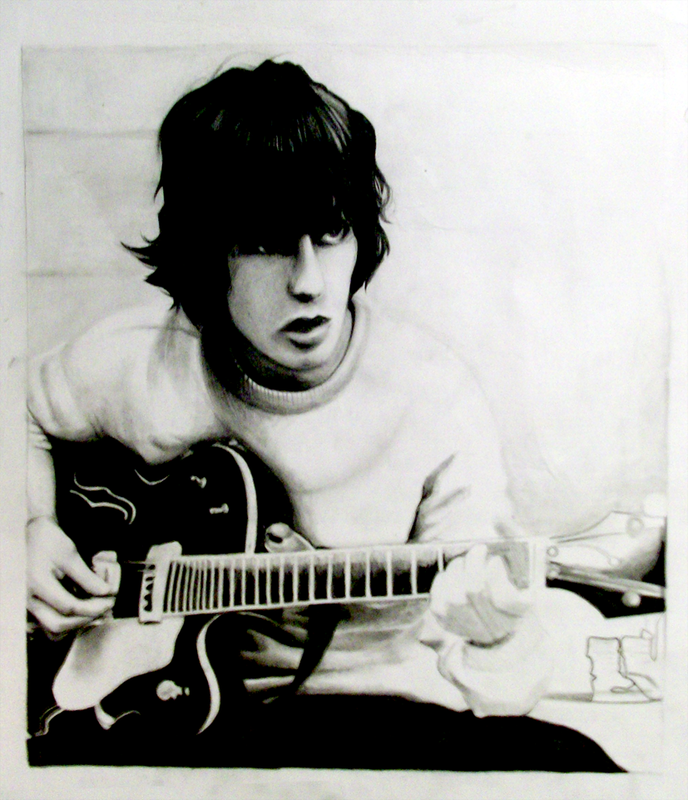 Harrison was also a session musician and a film and record producer. He is listed at number 21 in Rolling Stone magazine’s list of “100 Greatest Guitarists of All Time”. 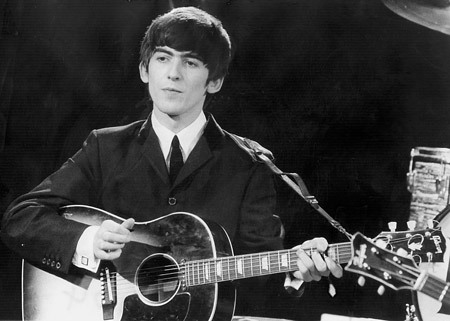 Two concerts will take place in Liverpool later to mark the 10th anniversary of George Harrison’s death. The concerts will take place at 14:00 GMT at St George’s Hall, and at 20:00 GMT at The Cavern Club where the Fab Four often played. Flags will also fly at half-mast at both the Liverpool City Hall and St George’s Hall. When I saw these animated GIF images of The Beatles, I just wanted to share them with our readers. 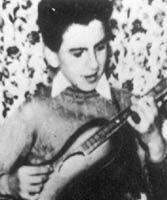 Banjo player Rod Davis, who was replaced by Paul McCartney soon after the Quarrymen started gigging, agreed with archivists who suggested the group first performed in the LIverpool venue on August 7, 1957. But he recently realised the date was wrong: the skiffle group had already played the Cavern by then. Davis tells the BBC: “No question about it: I played three or four times at the Cavern and is was definitely before August. 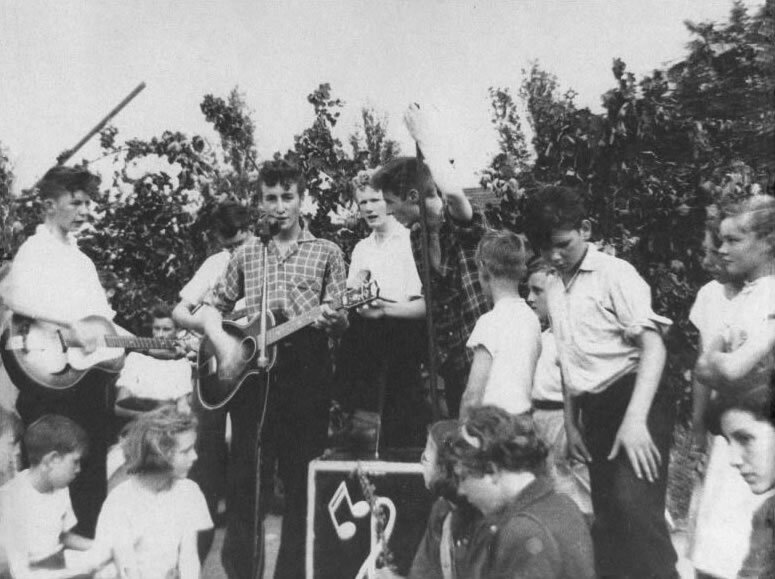 He has photographic evidence too, in a roll of film shot by his dad which recorded the Quarrymen’s first ever show at a church fete a few weeks earlier. “On the same strip of film was my family with my uncle who lived in Epping – we stayed the night with him before we went to France,” Davis says. “Despite telling Beatles biographers that I remembered the gig, I didn’t, so I’m as much to blame as everybody else. 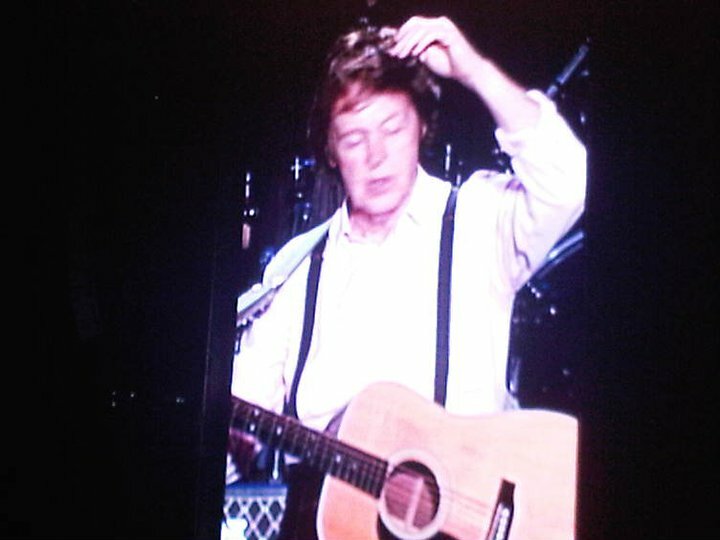 Davis recalls the moment he realised McCartney had taken his place in the band. 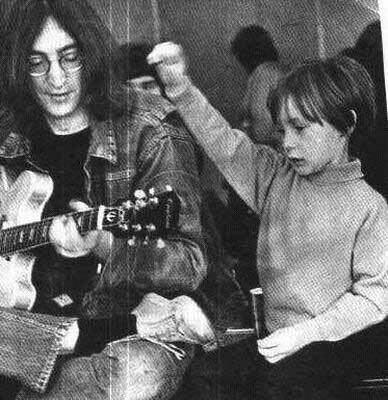 “The famous meeting with Lennon and McCartney was on July 6, and a couple of weeks after that I remember practising at John’s Aunt Mimi’s house. 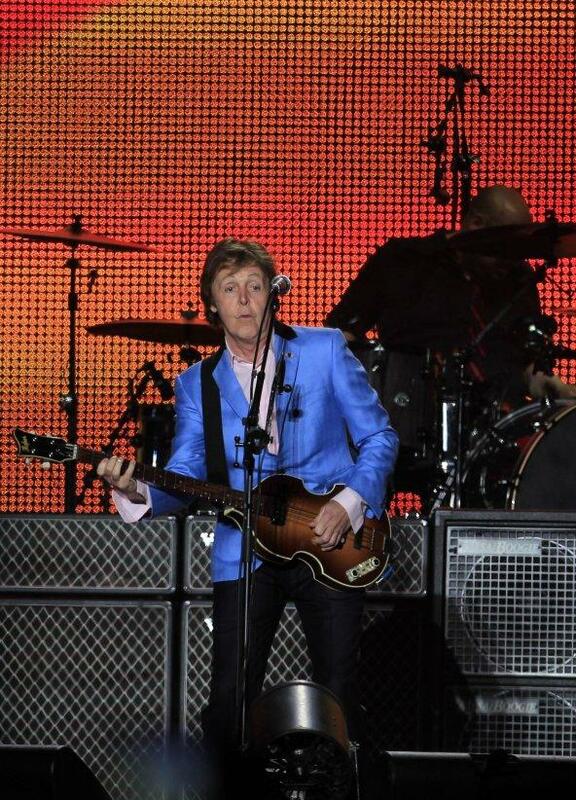 Sir Paul McCartney has told US media he appears to be a victim of phone hacking and will go to the police. It comes after his ex-wife Heather Mills alleged a senior Mirror Group journalist admitted hacking into voicemail messages left by him. 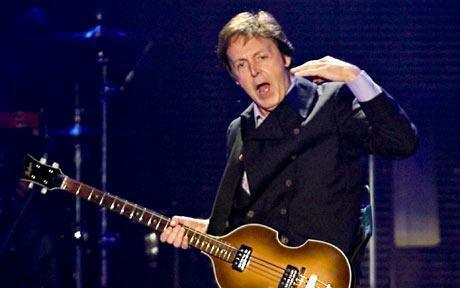 The former Beatle said he expected to learn more when he talked to police in the UK once his US tour was over. Speaking from Ohio, he told journalists phone hacking was “a horrendous violation of privacy”. “When I go back [to Britain] after this tour, I am going to talk to the police because apparently I have been hacked,” he said. “I don’t know much about it because they won’t tell anyone except the person themselves. So I will be talking to them about that. “I do think it’s horrendous violation of privacy. I do think it has been going on for a long time and I do think more people than we know knew about it. A musical version of the 1994 movie Backbeat is set to open at London’s Duke of York Theater in October. The original movie tracked the birth of The Beatles from their early days in Liverpool to their formative gigs in Hamburg, Germany. It also detailed the romance between the band’s original bassist Stuart Sutcliffe and German photographer Astrid Kirchherr. The stage version premiered, low-key, in Glasgow in 2010, but it’s now set for a West End theater run. 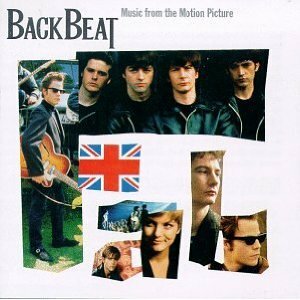 The soundtrack for the movie Backbeat was possibly even better than the film. Dave Grohl, Thurston Moore and R.E.M.’s Mike Mills all played on the Backbeat soundtrack, covering The Beatles’ raw versions of “Twist & Shout,” “Rock & Roll Music,” “Long Tall Sally,” “Please Mr. Postman” and more. Paul McCartney joined the parade of musical stars waking up the crew of the Space Shuttle Atlantis’ final mission with a rendition of the Beatles classic ‘Good Day Sunshine’ this morning. Of course, this morning was hardly the first time Beatles music has been played for the crew across the soon-ending thirty-year history of the program. ‘Good Morning Sunshine’ has been transmitted up to the space explorers three other times, including once directly from a live McCartney concert, and ‘A Hard Day’s Night,’ ‘Birthday’ and ‘With a Little Help From My Friends,’ among others, also have been blasted out into the final frontier. 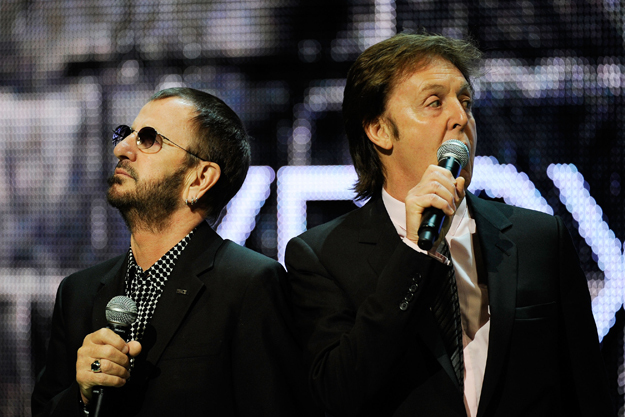 The surviving Beatles have quashed the rumors of a possible “reunion” at the London Olympics in 2012. Previously, it had been reported by U.K. newspaper The Sun that festival organizers were hoping to get Paul McCartney and Ringo Starr to perform together at the ceremonies, perhaps with members of the Harrison and Lennon families joining in to properly represent all four original Beatles. There is at least the possibility that McCartney himself might appear at the London Olympics, something he discussed in somewhat vague terms during an interview last month. 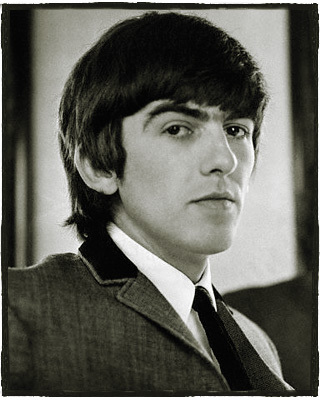 Martin Scorsese’s documentary about late Beatle George Harrison will debut on US cable channel HBO this autumn. Co-produced with Harrison’s widow, Olivia, it will feature home movies and interviews with surviving Beatles. Scorsese, who also made Rolling Stones documentary Shine a Light, said making the film was “a joy and an experience I’ll never forget”. Living in the Material World will be shown in two parts in October. It will be available on DVD on 10 October. Other interviewees include Harrison’s friend Eric Clapton, John Lennon’s widow Yoko Ono, and record producers Phil Spector and George Martin. Scorsese said the documentary had allowed him to spend time with Olivia Harrison “interviewing so many of George’s closest friends, reviewing all that footage, some of it never seen before, and listening to all of that magnificent music”. He said the first time he heard Harrison’s 1970 solo album All Things Must Pass “was like walking into a cathedral”. An accompanying book, written by Olivia Harrison, will feature photographs, letters and diary extracts from the star’s personal archive. 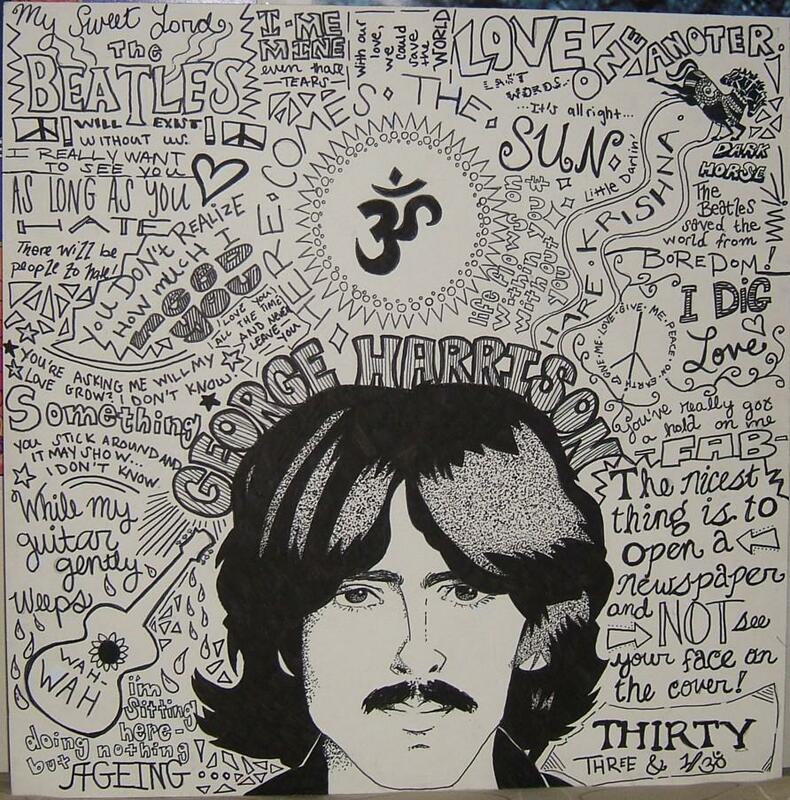 Harrison, who died of lung cancer in 2001, wrote Beatles songs including Something and While My Guitar Gently Weeps. He enjoyed further success, as a solo artist, and with the 1980s supergroup Traveling Wilburys. 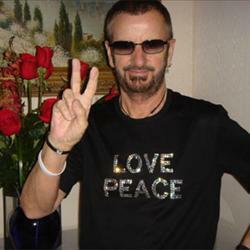 “Peace and love, peace and love.” That’ll be the message Ringo Starr has for the world this Thursday on his 71st birthday and he hopes they’ll have it, too. As he has for the past few years, Starr plans to make public his trademark call of “peace and love” as a birthday event. The former Beatles drummer will appear at the Hard Rock Cafe in Hamburg, Germany, where he and the All-Starr Band are in the middle of their summer tour. 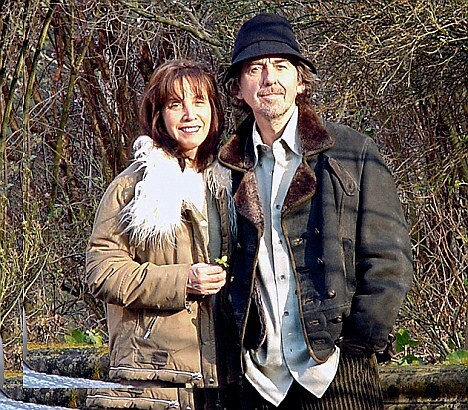 Starr, wife Barbara Bach, friends and fans will appear at noon local time to say “peace and love” and spread the word. Starr hopes fans will join in by saying it out loud, tweeting it or simply thinking the words at noon wherever they are. The custom had its origins in 2008 when he was asked during an interview “What would you like for your coming birthday?” His answer was “More peace and love.” On July 7, 2008, Ringo and wife Barbara Bach were joined by fans on the streets of Chicago in front of the Hard Rock Hotel to show the “peace and “love” salute. Memorabilia from the Beatles, Bruce Springsteen, the Who and other classic rockers earned big money at the Julien’s Auctions Music Icons sale over the weekend in Beverly Hills, Calif. 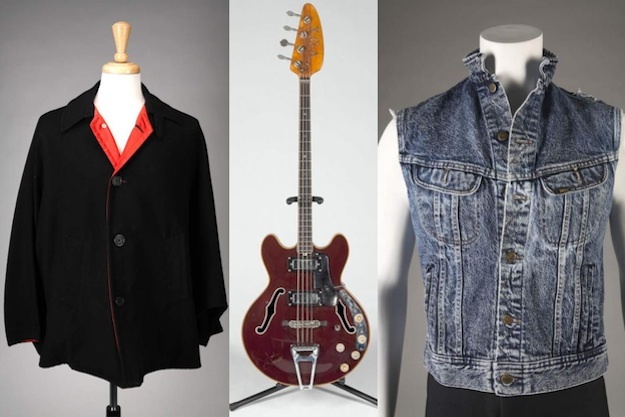 Among the items that scored the highest winning bids were Ringo Starr’s cape from the movie ‘Help’ ($37,500); an autographed Vox Sidewinder IV electric bass that late Who member John Entwistle purportedly played on an episode of ‘The Smothers Brothers Comedy Hour’ ($25,000); and Bruce Springsteen’s denim vest from his ‘Born in the U.S.A.’ tour ($20,480). Additional Beatles items, as well as memorabilia from Jimi Hendrix, Kurt Cobain, the Rolling Stones, Bob Dylan, U2 and Slash, also sold at the auction. The most prized item at the auction was Michael Jackson’s red ‘Thriller’ jacket, which sold for an incredible $1.8 million. Click here to check out the full list of items. 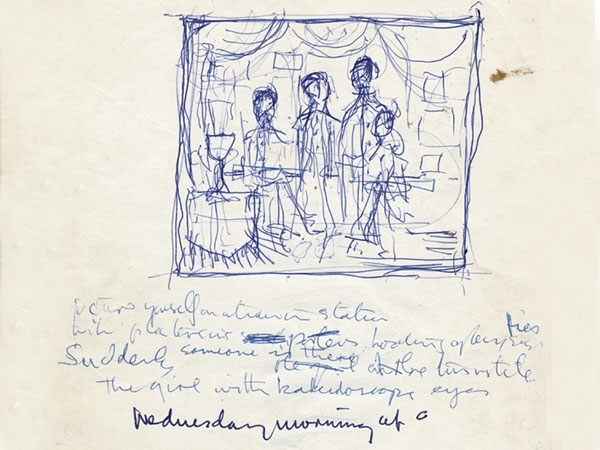 La letra de “Lucy In The Sky With Diamonds”, que fuera escrita a mano por John Lennon, será subastada el próximo mes de mayo. El escrito del tema que formara parte del álbum de The Beatles, Sgt. Pepper’s Lonely Hearts Club Band, incluye además de la letra de la canción, la apertura del tema así como un bosquejo de cuatro personas en una habitación vistas a través de una ventana cubierta por cortinas. Según la casa de subastas Profiles in History, se espera obtener por el manuscrito al menos 200 mil dólares. Muchos cerebros siguen combustionando en su afán por desentrañar el misterio sobre quién es realmente the one and only Billy Shears. Lo digo porque, a cuarenta años del lanzamiento del Sgt Pepper’s Lonely Hearts Club Band, millones de beatlemaníacos en todo el mundo continúan aún tras el rastro de este personaje tan tarareado pero de origen incierto; preguntándose, cual si fuera el eslabón pedido, si existió en carne y hueso, si fue un personaje ficticio o, a lo mejor, se trató de un mensaje cifrado que los Fab Four enviaron al mundo para dar a conocer, en su particular estilo, que algo grande había pasado con ellos. Una de las tantas versiones controvertidas acerca de la existencia de Billy Shears tiene que ver con otra discusión mucho más enrevesada y disparatada (pero comercialmente eficaz), como es la supuesta muerte de Paul McCartney, -según dicen- meses antes de iniciarse las grabaciones del Sergeant Pepper’s (noviembre de 1966), en un terrible accidente automovilístico, del cual quedó completamente desfigurado e irreconocible. Como es de suponer, tras la inesperada desaparición de Paul, la pena invadió a los otros beatles, pero lejos de publicitar su congoja ante sus millones de fans, siguieron los consejos de su casa discográfica -que dicho sea de paso, tenía mucho que perder con un beatle menos- y decidieron ocultar y maquillar el asunto, organizando un entretenidísimo concurso para encontrar al doble de Paul. Según cuentan, un tal William Campell, hasta ese momento un ilustre desconocido que laboraba en la policía canadiense, ganó el certamen por su extraordinario parecido con Paul. Pero aquí viene lo más insólito (e inexplicable): Campbell, el ganador, no sólo era idéntico físicamente a Paul, sino también (o maravillosa coincidencia) cantaba como Paul, tocaba el bajo como Paul y, cáiganse, componía silly love songs como Paul. Lo curioso, según los entendidos más suspicaces, es que el resultado del concurso de marras nunca se hizo público, por lo que el nombre de Campbell se mantuvo en el anonimato por largo tiempo hasta que los sucesivos hallazgos que perseverantes beatlemaníacos fueron encontrando en las letras de las canciones de los Beatles, lo hicieron salir de su escondite para alimentar más y más la leyenda negra que perdura hasta el día de hoy sobre la supuesta muerte de McCartney. Uno de esos hallazgos que demostraría la hipótesis acerca de la muerte de Paul se encontraría en el primer tema del Sergeant Peeper’s, homónima del nombre del LP, es considerada como la presentación en sociedad de William Campbell, aunque oculto bajo el seudónimo de Billy Shears. ¿Cómo así? 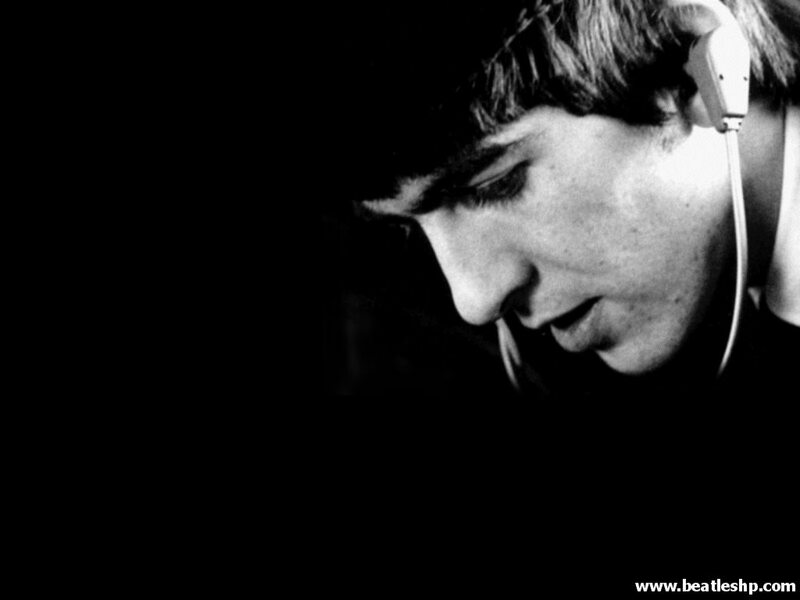 Acudamos a la misma letra de la canción que dice: so let me introduce to you, the one and only Billy Shears. Bastaría con un elemental análisis para saber que Billy, al ser apócope de William, es en realidad Campbell, aunque eso no probaría nada y dejaría todo en el aire. Pero ahí no acaba todo. 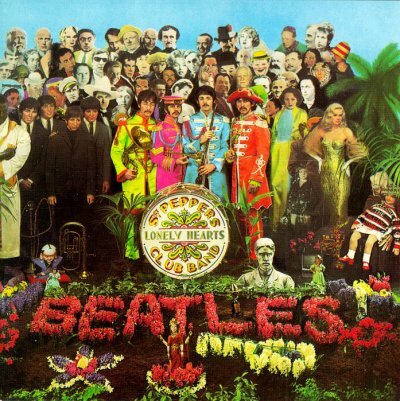 Muchos han percibido que la segunda canción del Sergeant Pepper’s (With a little help from my friends), es una especie de himno de agradecimiento y esperanza para un futuro mejor del tal William Campbell, en la cual éste solicita una ayudita de sus amigos (John, George y Ringo), para ejercer su rol de Paul con éxito y encajar en el engranaje de la maquinaria musical beatlesca que, en esa época, se tornaba imparable. Otra explicación, más terrenal y creíble si se quiere, sobre Billy Shears surge otra vez del mismo Paul (el vivo, no el muerto) al terminar de definir la idea conceptual delSergeant Pepper’s como un disco que rompería esquemas y borraría con lo hecho hasta el momento por el grupo. Su idea, además, era que los Beatles adoptaran una nueva identidad -metafóricamente hablando, por supuesto- en la Banda de los Corazones Solitarios, como una forma de desprenderse de la imagen de niños bonitos y formales con los que eran identificados hasta ese momento. Como toda agrupación necesita de un líder, Sgt. Peppers Lonely hearts club band eligió a un personaje ficticio, Billy Shears, para que sea su director de orquesta. Mimetizados ya en esta banda, Lennon y McCartney pusieron entonces su inspiración en ristre y armaron la canción que daría nombre al disco, pero con un final pletórico de aplausos y con sus voces en coro presentando a Biiiillyyy Sheeeaaars! !, dando paso inmediato a la voz de Ringo Starr interpretando With a little help from my friends, por lo que se deduce que Billy Shears, en realidad, fue creado para ser encarnado por el talentoso e infravalorado Ringo. El 29 de agosto de 1966 The Beatles se presentaban en vivo por última vez en el Candlestick Park de San Francisco, esto le ponía fin a una enorme y exhaustiva carrera de conciertos y dejaba al cuarteto con un gran problema: ¿Qué hacer con tanto tiempo libre? Estaban acostumbrados a jornadas de trabajo muy demandantes (entrevistas, viajes, conciertos, etc) por lo que de repente tener tiempo libre fue un cambio muy brusco en su rutina. Después de ese último concierto Lennon de plano se fue a hacer una película con Richard Lester: How I Won The War, Harrison prefirió conocer más sobre la cultura india, Ringo.. Ringo no sé que estuvo haciéndo, mientras que McCartney comenzó a idear el que sería el próximo álbum de The Beatles: el Sgt. Pepper’s Lonely Hearts Club Band. La creación del Sgt Pepper no fue sencilla, consumió una gran cantidad de recursos humanos y financieros, pero afortunadamente -para el mundo de la música- John, George, Paul y Ringo andaban aburridos, con mucho tiempo disponible y una capacidad económica suficiente para solventar cualquier capricho o investigación en ingeniería de sonido o ideas musicales. Las grabaciones de este disco iniciaron el 6 de diciembre de 1966 y después de más de 700 horas de grabación concluyeron el 20 de abril de 1967, algo inverosímil en aquellos años si tomamos en cuenta que el primer álbum de The Beatles: Please Please Me se grabó en tan solo 10 horas. Prácticamente todo el Sgt Pepper se grabo y mezcló en Abbey Road alcanzando un costo de 75,000 libras de aquellos días. La idea original de Paul era presentar un disco en vivo, parte de la idea se mantuvo y es por eso que el álbum inicia con sonidos de una banda afinando y la gente congregándose previo a un concierto, además de que la penúltima pieza es la despedida en falso de ese concierto para llegar al encore: A Day In The Life. Para bien o para mal la idea principal deformo un poco y el producto fue el primer álbum conceptual jamás creado: Sgt. Pepper’s Lonely Hearts Club Band. 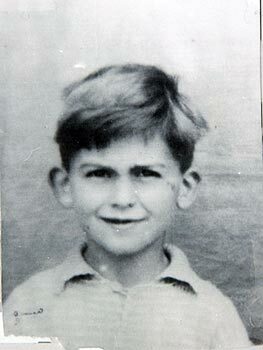 George Harrison nació el 25 de Febrero de 1943 en Liverpool, Inglaterra. Hijo de Harold Harrison un marino retirado que luego trabajó de chofer de un autobus y de Louise. A los doce años de edad ingresa en el Liverpool Institute for Boys, donde conoce a Paul McCartney quien mas tarde lo presentaría a John Lennon, ingresando así a “The Quarry Men”, grupo que después de cambiar varias veces de nombre se pasó a llamar The Beatles, una de las bandas mas reconocidas de la historia del rock mundial. Harrison, además de ser un músico, en sus primeros años después de la escuela estaba trabajando como aprendiz en el oficio de electricista, que en un futuro lo ayudó a arreglar los equipos deteriorados, además de poder experimentar un poco mas con el sonido. En un principio, ingresado en los Beatles, por su corta edad no era muy bien visto por el resto de los miembros de la banda, además de que no contaba con un virtuosismo auténtico para tocar la guitarra. A pesar de esto sabía la cantidad de acordes suficientes para tocar en los primeros discos, y a medida que fue pasando el tiempo, con el ensayo y el estudio, logró tener un sello muy personal en el toque de su instrumento, siendo la guitarra rítmica y principal de su grupo. En lo que respecta a la personalidad de este músico inglés, existe una contrariedad, ya que a pesar de mostrarse tranquilo y apartado en las conferencias de prensas con los Beatles, sus amigos mas cercanos dicen que cuando tiene cercanía con la gente a la que trata es muy hablador. George Harrison, después de tener varias experiencias con la religión oriental se convierte al hinduísmo, luego de conocer acerca de la reencarnación, por un libro que le prestaron en una de las giras con la banda de Liverpool. A medida que fue pasando el tiempo en la banda, Harrison fue componiendo cada vez más y mejores canciones, lo que hizo que rápidamente compitiera con las de Paul y John. Después de la muerte de Brian Epstein, manager de la banda, empezaron a haber fuertes peleas entre estos músicos. Paul McCartney dió a conocer varias veces su disconformidad con la forma de tocar de George, hasta que cansado de todo esto, Harrison abandona la banda. En el año 1970 lanza su primer disco solista, que tiene la particularidad de ser el primer álbum triple de la historia, titulado “All Things Must Pass”. No fue solo eso, si no además fue el primer músico en realizar un concierto con fines benéficos siendo el Concert for Bangla Desh el 1 de agosto de 1971, con un total de 40.000 personas aproximadamente que asistieron. En 1973 lanza su segundo disco, “Living in the Material World”, que poseía letras mas espirituales y filosóficas que el anterior álbum. Al año siguiente sale a la venta su tercer álbum de estudio “Dark Horse”. Su esposa hasta ese momento, Pattie Boyd, después de tener varios problemas con George se va con su mejor amigo Eric Clapton. Esto hizo que se divorcien el 9 de Junio de 1977, aunque Harrison ya estaba enamorado y conviviendo con Olivia Arias, con quien se casa en 1978. Su cuarto álbum y último bajo el sello Apple se llamo ” Extra Texture (Read All About It)” y fue grabado en el año 1975. “Thirty Three & 1/3” es el nombre del quinto disco de George, quien mientras lo grababa tuvo problemas en el hígado, sufriendo de hepatitis. Harrison tuvo su único hijo en el año 1979, con su esposa Olivia, a quien llamaron Dhani Harrison. Junto a él vino su último álbum de la década de los 70´s llamado “George Harrison”. En la década de los 80´s George graba otros tres discos titulados: “Somewhere in England” (1981), “Gone Troppo” (1982) y “Cloud Nine” (1987), siendo estos tan exitosos como los anteriores. En 1992 se lanza al mercado un álbum titulado “Live in Japan” (1992) que es el compilado de una gira que hicieron juntos George junto a Eric Clapton. El 30 de diciembre de 1999, Harrison fue sorprendido en su casa por un intruso armado con una navaja quien lo atacó, pero no fue nada grave. El violento fue capturado por la policía y encerrado en un manicomio, después de declarar que fue poseído por el espíritu de Harrison. En toda la década de los 90´s Harrison tuvo que luchar contra el cáncer producido por el vicio del tabaco. Debió someterse a una operación de los pulmones y de la boca. En el año 2001 reapareció esta enfermedad pero esta vez en forma de metástasis que terminó matándolo el 29 de noviembre de ese año, a la temprana edad de los 58 años, en Hollywood, los Ángeles.